Sure, going to the dentist is scary. Who wants sharp metal objects jammed inside their mouth? Or those suction things — yikes! It’s no wonder a lot of us avoid the annual appointment, despite common recommendations to regularly visit the dentist. What’s worse, though? The cost of going to the dentist. About one in four kids under the age of 10 have untreated cavities or tooth decay. And 34% of low-income adults over 65 are missing teeth — that’s compared with 13% of the older adults living above the poverty line. A routine exam and cleaning costs around $150 without insurance. Multiply that by the recommended two visits per year and that’s about $300 per year for each person in your household. That can quickly add up to thousands of dollars. When the kids need braces, you’re looking at $3,000-7,000 for metal braces and up for more discreet options like Invisalign. Your health plan or Medicaid may cover part of the cost of braces for children under 18. If you pay out-of-pocket, the cost could be tax deductible. But when none of these options are available, what’s your plan? You may not be able to cover thousands of dollars out-of-pocket, but you still want the best dental care possible for your kids and yourself. Dentists and orthodontists know this. They also know their services are often not covered well by insurance and are cost-prohibitive for many families. They’ve come together in a lot of ways to provide care to those in need. Though you’ll see some care for adults, most subsidized or free dental care exists to help children from low-income families. These services help cover major costs like braces, or smaller ones like the semi-annual check-up your kids need to maintain healthy teeth. Smiles Change Lives offers braces to kids between ages 10-18. You’ll be responsible for a non-refundable $30 application fee and an out-of-pocket $650 for the braces. Financial qualifications for SCL may be tough for some families. A family of four, for example, must have a household income of less than $48,500 (the number varies for areas of the country with higher costs of living). In addition to the household income and age requirements, you’ll need a family dentist to complete a referral form that confirms good oral hygiene, no unfilled cavities and no more than four remaining baby teeth. This must be based on a dental exam no more than 30 days prior to the application date. Of course, this means before qualifying for subsidized orthodontic services, you’ll either need to be able to afford a dental exam or have insurance coverage for one. If you can’t afford this either, keep reading. We’ve found services to assist with that, too. The American Association of Orthodontists provides a list of Donated Orthodontic Services. It’s limited to select states, but these provide care to children who don’t have insurance coverage or don’t qualify for assistance. The Smile for a Lifetime Foundation is a non-profit, charitable organization that provides orthodontic treatment for underserved patients. The foundation is comprised of local chapters, each headed by a Board of Directors that selects individuals who qualify for assistance. The requirements and application process vary by provider. To apply, search for providers in your area. Find the Smile for a Lifetime logo on the provider’s website to view their application requirements and process. Started in St Louis in 2002, Give Kids a Smile was adopted by the American Dental Association and now is a national program. The organization brings volunteers and dental professionals together to provide care and education to underserved children. A variety of projects at schools and clinics around the country provide services including cleanings, exams, fluoride treatments, sealants, oral surgery and x-rays. National GKAS Day is the first Friday in February each year. To find participating programs in your state, contact your local dental society. Advantage Smiles for Kids (ASK) aims to improve the quality of life for low-income, at-risk children in Oregon and Idaho. The organization serves children ages 10-16 with a “high aesthetic need for braces” — kids who are being teased or bullied because of the way their teeth look. This program is referral-only and there’s no online application. Read the full eligibility requirements: If you think your child qualifies, give them a call. To encourage those receiving assistance to “pay it forward”, ASK requires that the child receiving orthodontic care volunteer in their community each month. The parent/guardian pays $25 per month toward the cost of braces. As its name suggests, these services are only available in San Diego. But they’re worth a look if you’re in the area. The Children’s Dental Health Association funds a local Children’s Dental Health Center. Their School-Based Program also visits local low-income schools to provide exams, screenings and sealants to children on-site. Many low-income parents simply opt out of dental care for themselves. Instead, they put their energy and dollars into finding assistance or paying out-of-pocket for their children’s care. But your teeth need care, too! The Dental Lifeline Network’s national Donated Dental Services serves low-income people who have a disability, are elderly or are medically fragile (a dental condition is preventing them from receiving medical care). The donated services cover oral care, dentures, bridges, crowns and other tooth repair. Qualification requirements and availability of services vary by state. Check to ensure you qualify and that the organization is accepting applications in your state and county. 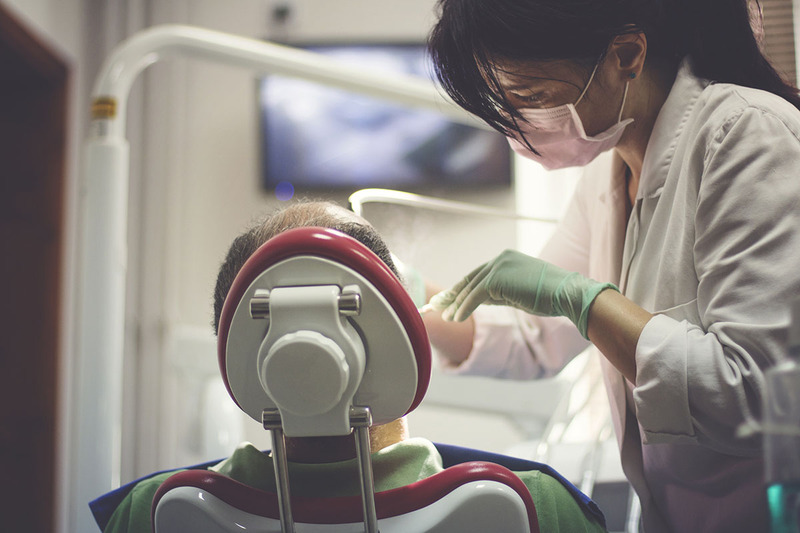 If free services aren’t available in your area, or you don’t qualify for subsidized care, a discount dental plan could save you a lot of money. For dental care without insurance, look at DentalPlans.com. The site doesn’t provide free services or insurance coverage; instead it allows you to receive discounted dental care. For an annual membership fee starting at $79.95, you’ll get a 10 to 60% discount on most dental services. You’ll pay out-of-pocket for the services, but much less than without the plan. If you haven’t found what you need here, your state might offer additional programs. Check this list from the AAO to find out what’s available in your state. When your only option is to pay out-of-pocket, you can visit nearby dental schools for discounted services. After years of training, students act as apprentices under the supervision of professional dentists and orthodontists to perform dental procedures, just like a private practice. Find an accredited dental school near you. With shifting health care coverage and many of us leaning toward self-employment, affordable dental and orthodontic care is increasingly difficult to come by. Check out the available resources your area to see what is available and get the care you need for your family. Dana Sitar (@danasitar) is a Staff Writer at The Penny Hoarder. She’s written for Huffington Post, Entrepreneur.com, Writer’s Digest and more, and she hasn’t seen a dentist in nine years because of a lack of insurance coverage.